We always welcome your financial support. You can donate by clicking on the button below. KARAMA is tax exempt under Internal Revenue Code 501(3)c. We use PayPal for secure transactions by credit card or by PayPal account. On the PayPal page you can specify that your donation be applied to the Arab Film Festival. All donations are acknowledged in the Festival program distributed at all screenings. 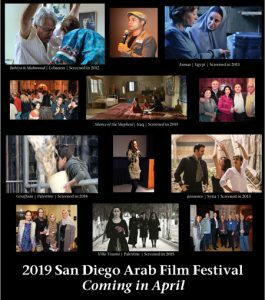 If your employer offers a benefit of matching your charitable contributions, please consider requesting a match for your contribution to KARAMA to support the Arab Film Festival in San Diego. There are four levels of sponsorship available. They include a variety of incentives, depending on level, that range from acknowledgment and advertisement space in the Festival program to tickets, promotion of logos on the festival website and in emails and Thank You plaques. Friend: $250 level; Friends are acknowledged in the Festival program and on screen at each screening and receive two festival passes. Bronze: $500 level; Half page ad in program, logo on web page and email announcements, on-screen thank you at each screening, four festival passes. Silver: $1000 level; Full page ad in program, logo on web page and email announcements, on-screen thank you at each screening, two festival passes and four addition tickets to screening(s) of choice. Gold: $2500 level; Thank You plaque, full page ad in program, logo on web page, email announcements and festival poster, on-screen thank you at each screening, six festival passes. Click here to download our partner information sheet. Full Page: 4.875” x 7.875” printable area for $200. Half Page: 4.875” x 3.875” printable area for $125. Quarter Page: 4.875” x 1.875” printable area for $75. Click here to download our advertising opportunity information sheet. Of all of the publicity methods we have tried, the one cited most by those who have attended past festivals is “heard about it from friends.” Please spread the word about the Film Festival among your friends and colleagues. Like us on Facebook at https://www.facebook.com/www.sdaff.org and share with others. Putting on a film festival requires lots of volunteers with all kinds of experience and skill levels, from ticket takers and ushers to social media managers. If you would like to volunteer, email us at volunteer@sandiegoaff.org.